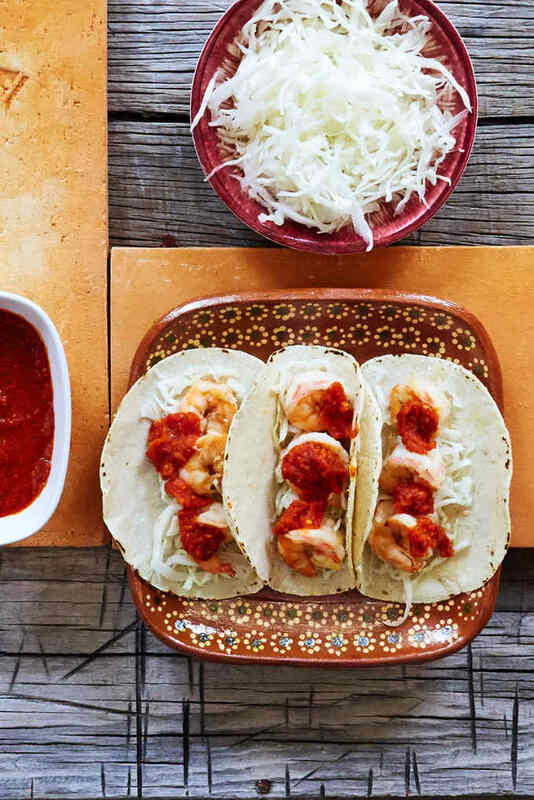 These garlic shrimp tacos are a mashup of flavors which work really well together. Buttery, garlicky shrimp served on a bed of tangy vinegar slaw topped with a sharp arból chile salsa with a touch of Mexican oregano. A nice sharp salsa counterbalances the rich buttery shrimp. 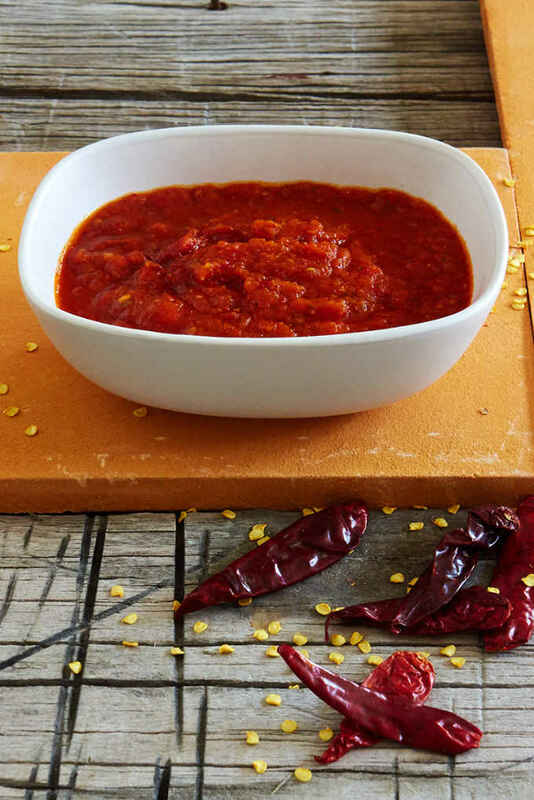 As we have prepared it, the salsa is very sharp and very hot from the quantity of chiles we have used. 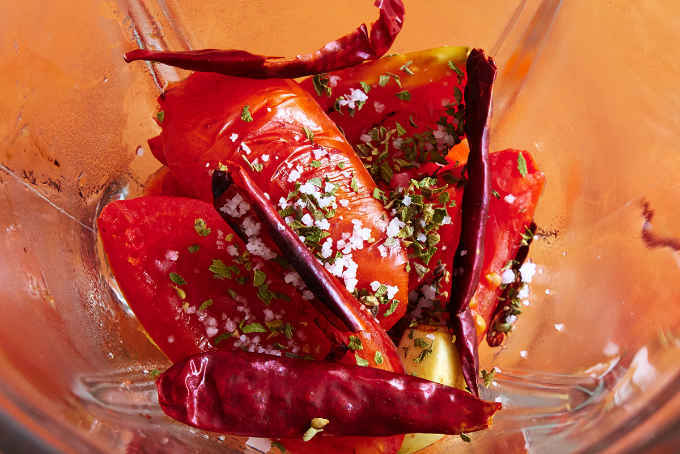 Reduce the number of chiles if you prefer a mild salsa. 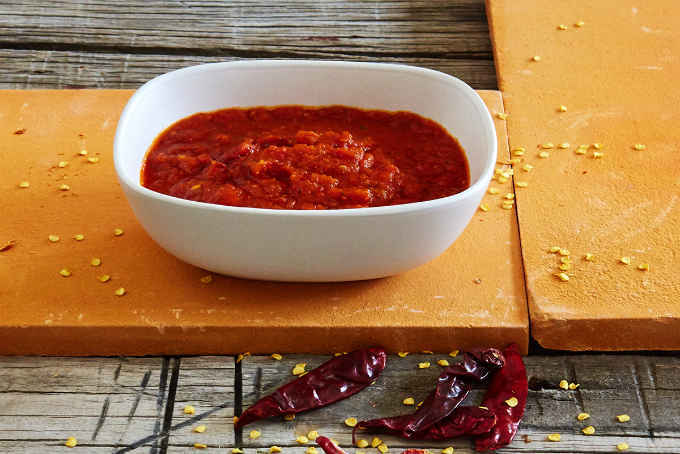 Try this salsa with our pan-fried fish tacos too. 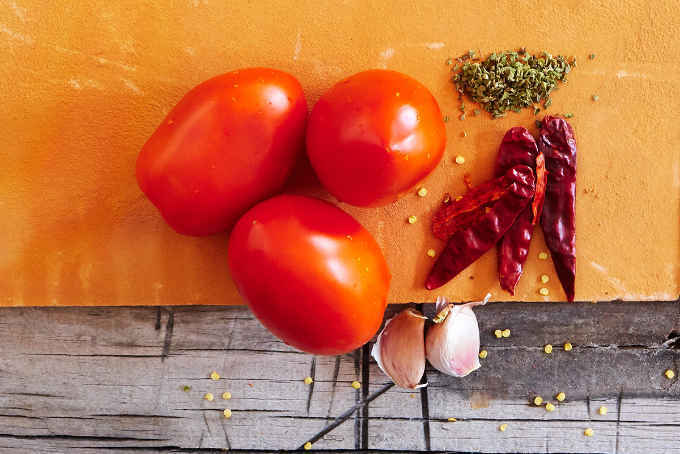 Ingredients for the salsa: plum tomatoes, garlic, arból chile and Mexican oregano. Let’s start – Quarter the tomatoes and peel the garlic cloves. Heat a large dry frying pan to medium hot. 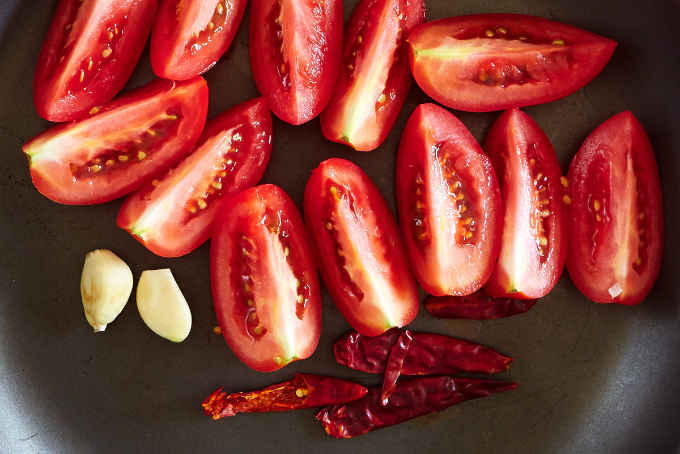 Add the quartered tomatoes, garlic and árbol chiles to toast. 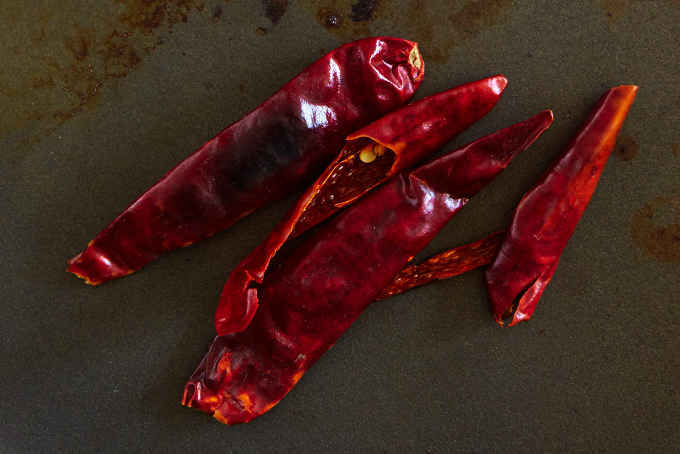 Toast the chiles for 30 seconds on each side and then remove from the pan. Toast the garlic for 2 more minutes then remove from the pan. Continue the toast the tomatoes until they blacken. Add all of the ingredients except the oil to your blender and blend for 1 minute. 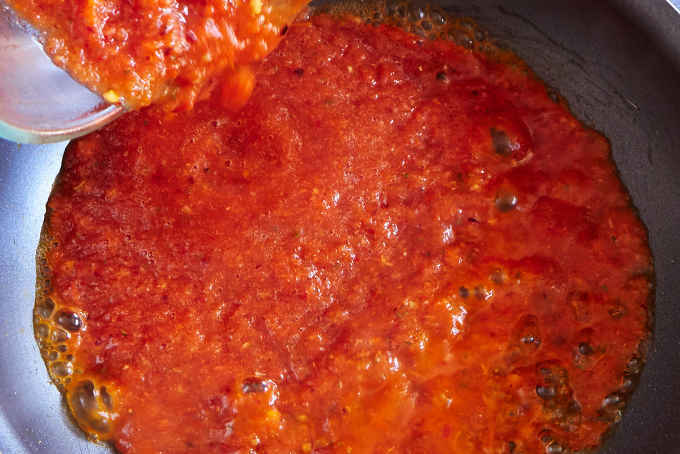 In the same frying pan that you toasted the tomatoes, garlic and chiles heat the 2 tablespoons of oil to high heat. Pour the blended salsa into the hot oil. 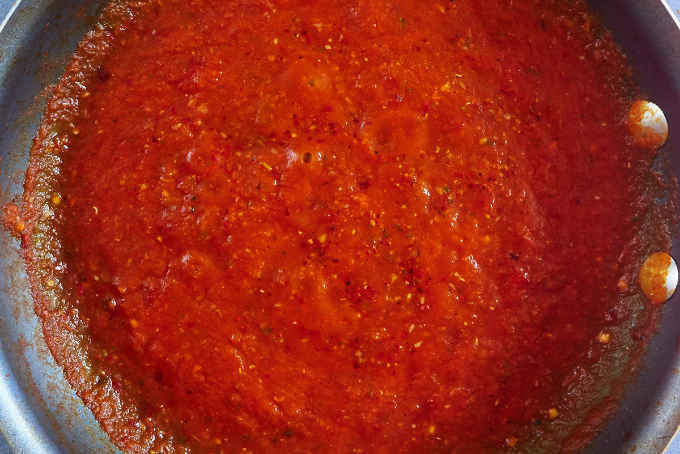 Reduce the heat to a simmer, then cook the salsa for 10 minutes. 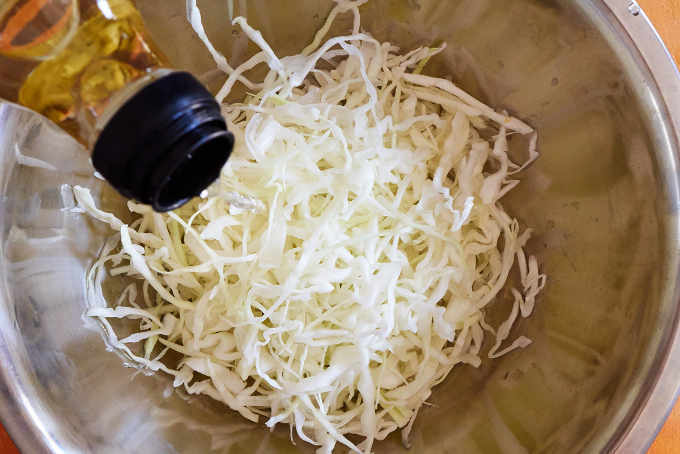 Pour 2 tablespoons of apple cider vinegar into the bowl with the cabbage. 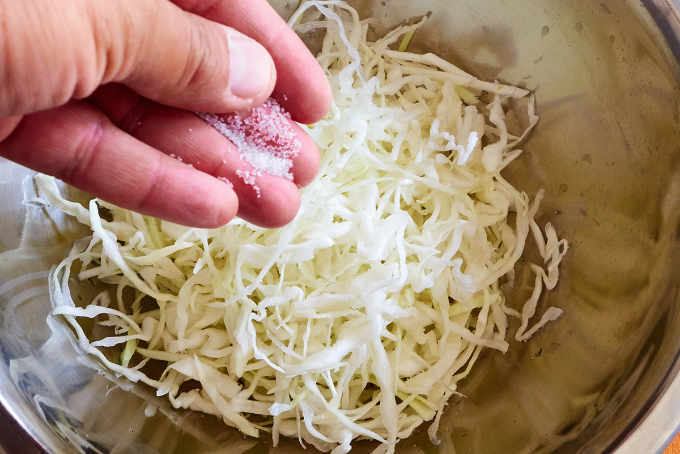 Mix thoroughly so that all of the cabbage is coated with vinegar and salt. Set aside until you are ready to serve your tacos. If your shrimp come with the shells, remove the shells. 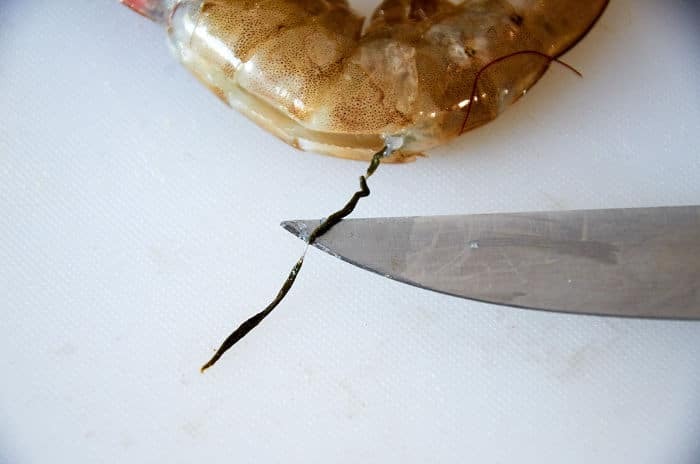 Devein the shrimp by making an incision lengthwise along the back of the shrimp and gently remove the black vein with the tip of a knife. Finely chop the garlic. Preheat a large frying pan to medium hot. Add the chopped garlic and cook for 1 minute stirring 3 times so that the garlic doesn’t burn. Add the shrimp to the pan and stir to coat the shrimp with butter. Cook the shrimp for about 6 minutes until just cooked through. 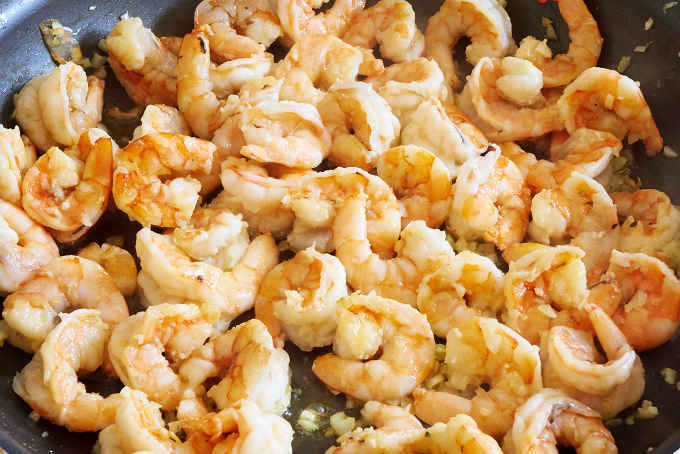 Stir and turn the shrimp every minute. To check for doneness, cut a couple of shrimp in half. If the shrimp is a pinkish white throughout it is fully cooked. 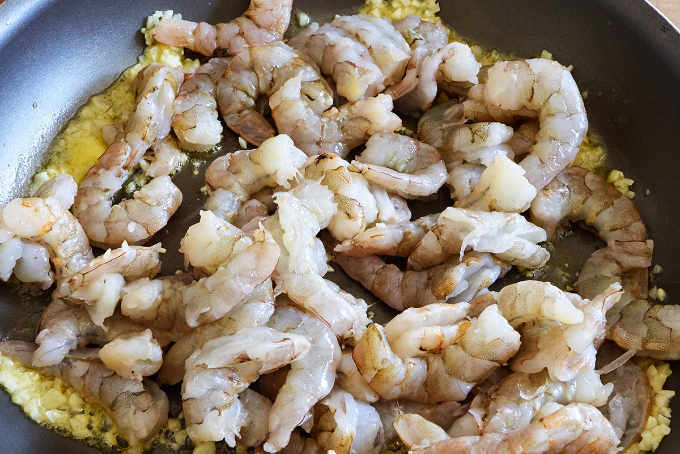 If there are still translucent spots the shrimp needs to be cooked more. Cook for 1 more minute and then check for doneness again. This is the easiest and most fun part. 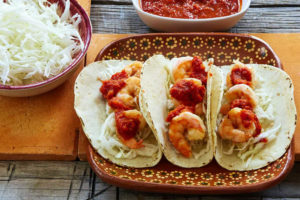 On each corn tortilla, layer a bed of cabbage slaw, 3 shrimps and then a dollop of salsa on each shrimp. Serve 3 tacos per person, and then enjoy! Toast the garlic for 2 more minutes then remove from the pan. Continue the toast the tomatoes until they blacken. 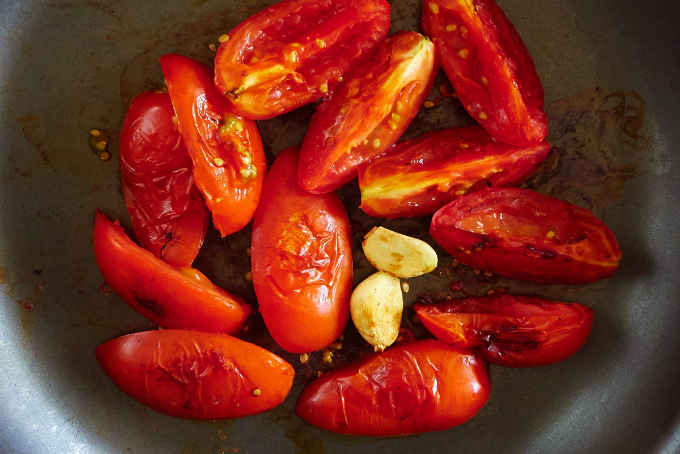 In the same frying pan that you toasted the tomatoes, garlic and chiles heat the 2 tablespoons of oil to high heat. Pour the blended salsa into the hot oil. 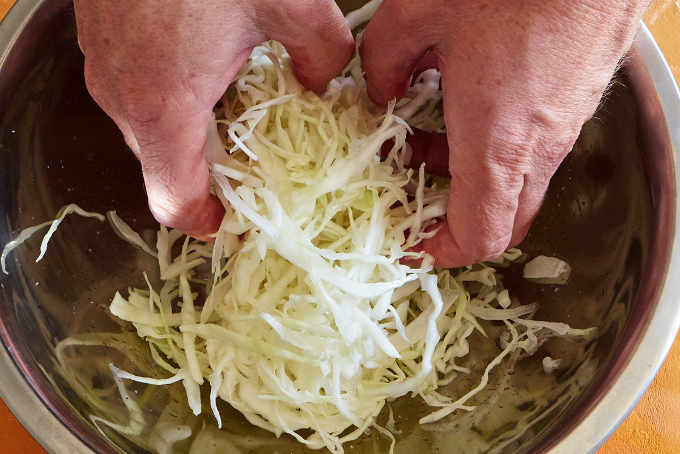 Mix thoroughly so that all of the cabbage is coated with vinegar and salt. Set aside until you are ready to serve your tacos. Stir just before serving. 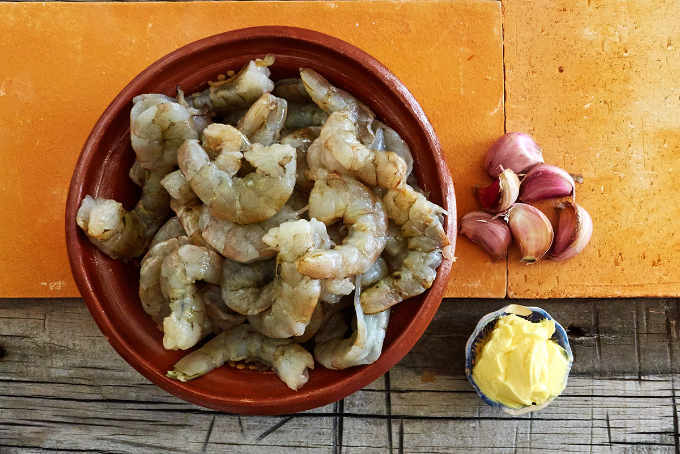 If your shrimp come with the shells, remove the shells and discard. Preheat a large frying pan to medium hot. 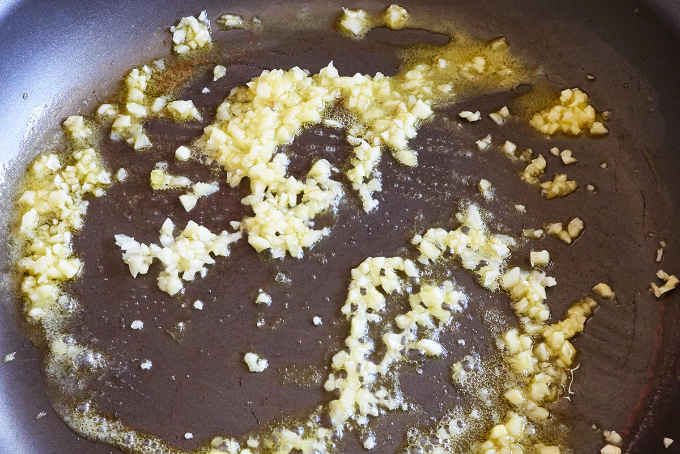 Add the chopped garlic and cook for 1 minute stirring 3 times so that the garlic doesn't burn. Warm the tortillas on a comal or griddle. 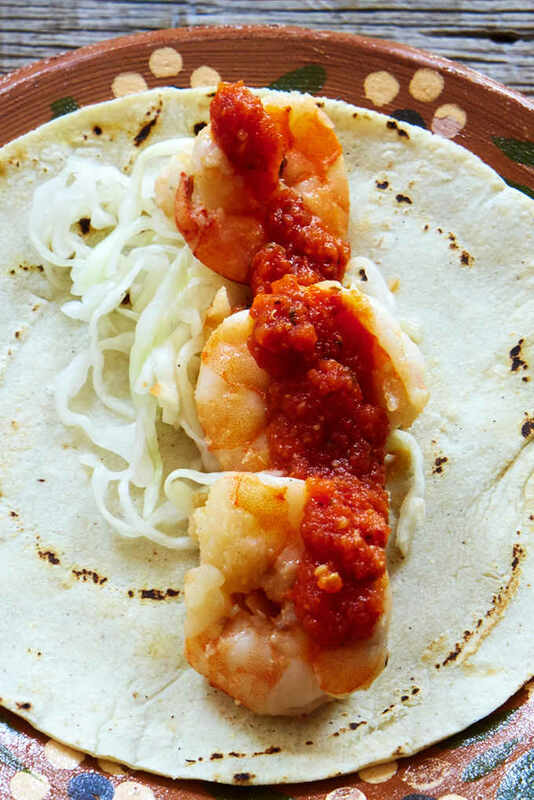 On each corn tortilla, layer a bed of cabbage slaw, 3 shrimps and then a dollop of salsa on each shrimp. Serve 3 tacos per person.